The S&P/TSX Composite climbed 0.67 per cent for the trading week ending with Thursday’s close and the benchmark stands 2.6 per cent higher year to date. In terms of technical analysis, the index has a Relative Strength Index (RSI) reading of 49.5 which is about mid-point between the buy signal of 30 and the RSI sell signal of 70. There are 19 oversold, technically attractive benchmark member stock by RSI this week. The list is once again dominated by precious metals names as IAMGOLD Corp., Osisko Gold Royalties Ltd., MAG Silver Corp., Agnico Eagle Mines Ltd., Novagold Resources Inc. and Alamos Gold Inc. (A) are the most oversold stocks in the index. Gold stocks will be driven more by the commodity price than technical factors so I picked Tim Hortons owner Restaurant Brands International Inc. as the focus chart this week. 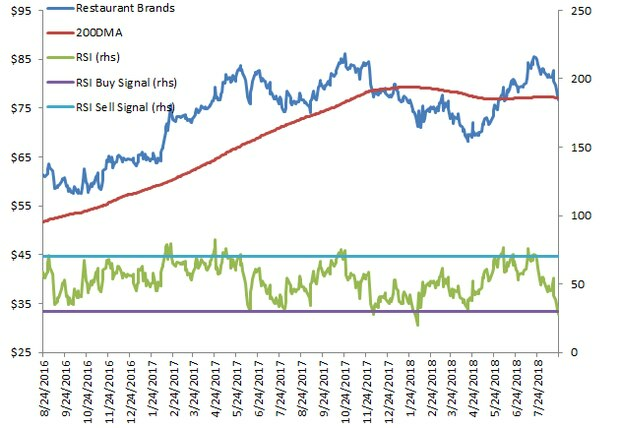 RSI buy signals have worked reasonably well, but certainly not perfectly, in uncovering profitable buying opportunities for Restaurant Brands. A buy signal on June 12, 2017 ,was followed by a 9-per-cent rally in the following two weeks, but the price quickly reversed course and erased the gains. Another buy signal in December of 2017 didn’t work at all – the stock went sideways briefly before heading distinctly south. In February, 2018, a buy signal predicted a 7-per-cent rally but again, selling pressure pushed the stock lower immediately afterwards. The most lucrative buy signal was in April of 2018. The price hit oversold levels on April 17 and then jumped 24 per cent to July 19. The technical attractiveness of Restaurant Brands stock now is not clear cut. Buy signals have had mixed success in the past 24 months. This case, I think, depends on fundamental research and the forward profit outlook. Technical analysis should only be used as a final step in the investment decision as to whether to buy or not. There are 15 overbought, technically vulnerable stocks according to RSI this week. Enercare Inc. is the most overbought stock in the index, followed by Ensign Energy Services Inc., CIBC, Canopy Growth Corp. and Gibson Energy.